Indigenous to South America, the root of this plant can be eaten as a vegetable or a fruit. Due to its sweet taste and crunchy texture, it has been called apple of the earth. 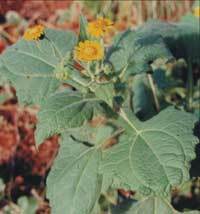 A stately upright perennial bush 1-2 metres tall with large velvety, arrow-shaped, dark-green leaves, 30cm long and 20cm across. The central trunk and off-shooting stems are hollow and of a soft fibre structure. Multiple stems can develop from the vegetative eyes of the underground rhizome. This central swollen, knobby, pink/purple rhizome may be eaten when young, but becomes fibrous and woody as it ages. It is the long, swollen, tuberous roots (developing from the central rhizome, 15-40cm in length, 5-10cm in diameter, forming like thick spokes around a wheel hub) that provide the portion prized for its sweet taste. Tuber skin is approximately 3mm thick, brown or purple in colour, while the inside of the tuber is white or cream coloured, juicy and easily cut with a knife. A tuber can weigh from 200g to 2 kg. From late summer to autumn, small, yellow, daisy flowers form as terminal clusters. These look like miniature sunflowers, which is not surprising as both plants belong to the Asteraceae family. The tubers are soothing as well as nourishing to the spleen, stomach, lungs and pancreas, and valued as a strengthening tonic for the whole body, giving energy and vitality. Being low in calories, this is a practical vegetable for dieters and diabetics, and the inulin has proved beneficial in stabilising blood sugar levels. The tuber can be eaten regularly as a food, or juiced for a refreshing drink. Some diabetics juice the tuber and freeze the juice in small containers, to have it available all through the year. Fructose enhances the digestion of foods, particularly the metabolism of carbohydrates, and has a thermogenetic effect, helping the body to burn off calories that have been stored as fat. Leaves are used fresh or dried as a tea with hypoglycemic properties and are commercially sold as such in Brazil. Sweet fruit root tubers are high in potassium, with 2230mg per 100g, only surpassed by dulse 8060mg, kelp 5237mg, salad mallow at 3680mg (p 298), sweet leaf 2770mg (p 312). Most other foods are well below sweet fruit root in potassium, with the next highest being soya beans (1677mg), rice bran (1495mg), wheat bran (1121mg), sunflower seeds (920mg) and parsley (717mg). Potassium is often called ‘the healing mineral’, because it is essential for the repair and health of all muscles and vital to the heart and liver. This mineral is important for balancing the acid/alkaline levels, transporting oxygen to the brain, for nerve impulses and to the blood and skin. Potassium is essential for digestion of carbohydrates, for the conversion of sugar to energy and for stimulating the kidneys to eliminate wastes. An interesting research finding is that cancer cells cannot live in a potassium rich environment. We can all benefit from potassium rich foods, daily. 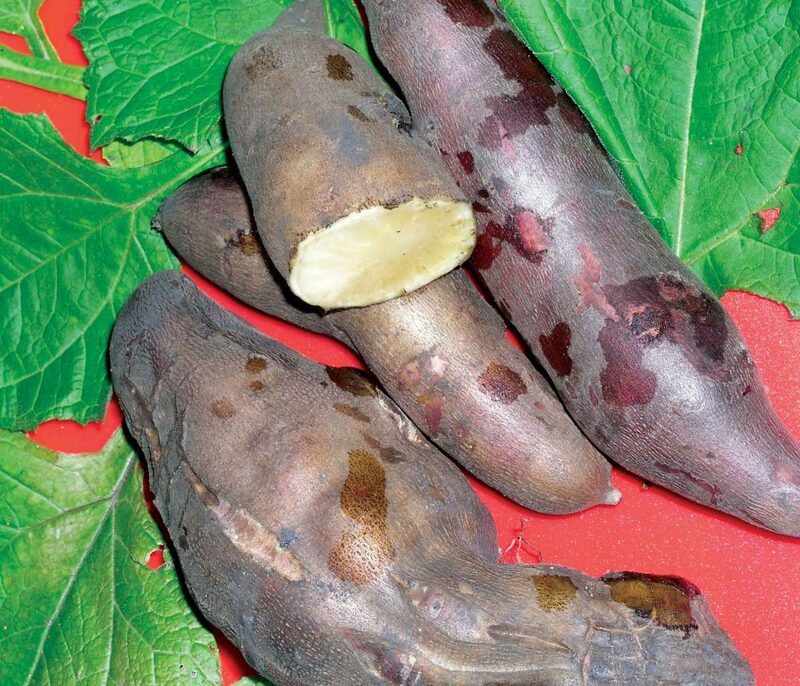 Sweet fruit root is also rich in calcium, yielding 143mg per 100g of tuber. The only foods higher in calcium are the leaves of turnip, kale and collard (probably never eaten by most people) and sesame seeds. Calcium is essential for glands, skin and digestion, for strong bones and teeth and for protection from viral infection and fatigue. The magnesium content of the tuber is 390mg per 100g of tuber, which is extremely high compared to most other foods we eat. Magnesium is important to the body for the formation of tissues and the strengthening the memory and the nervous system, and for the spinal cord and heart. Iron content is also exceptionally high at 55mg per 100g of tuber, with most other foods we eat being considerably lower; for example, wheat at 14.9mg, sesame seed 10.9mg, sunflower seed 7.1mg, and green leaf vegetables 3-6mg. Iron is essential to every cell of the body, and is vital for oxygenation of the body, and the haemoglobin in every red blood cell.